Today I'm in Portland2—go up to Brunswick3 tomorrow to speak4 for the Longfellow5-Hawthorne6 Centennial. Hope to stop in Boston7 on my way home8. 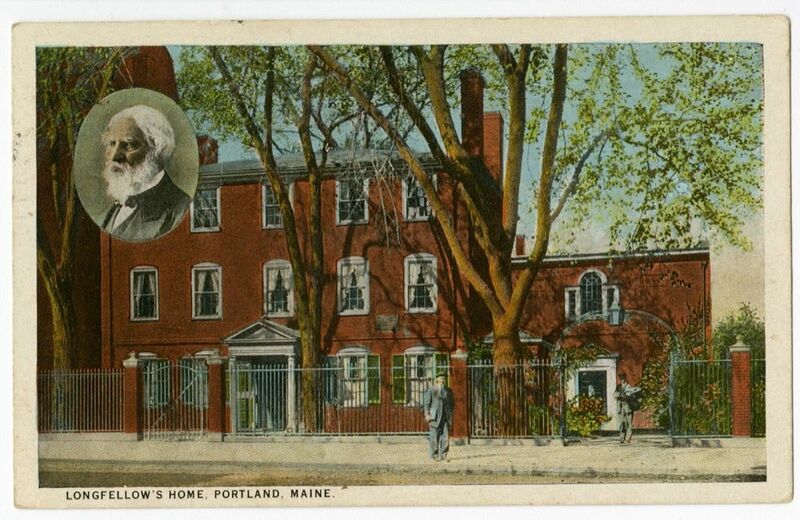 Document is one leaf with image of Longfellow's Home in Portland on recto. 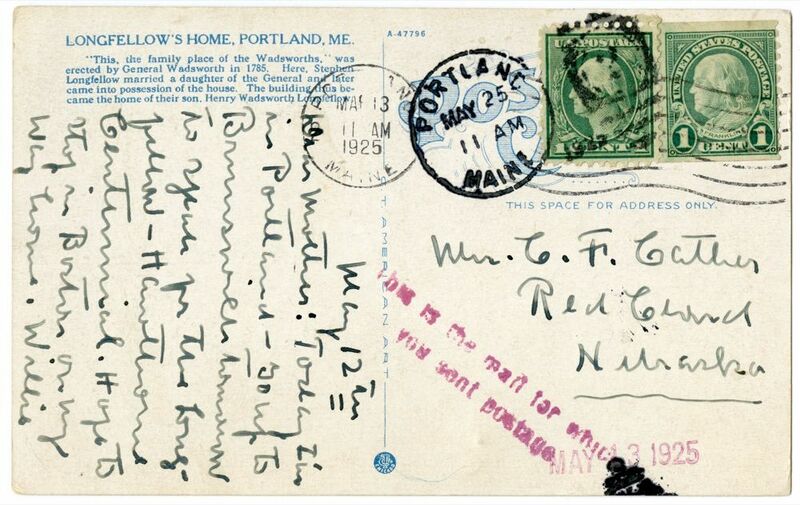 Handwritten message on verso of postcard. On 13 May 1925, Cather gave a lecture titled "The Talk About Technique" at Bowdoin College as part of its Institute of Modern Literature, an event held on the centennial of Henry Wadsworth Longfellow's and Nathaniel Hawthorne's graduation. Reports of the lecture are in Bohlke's Willa Cather in Person. Longfellow, Henry Wadsworth (1807-1882). American poet. 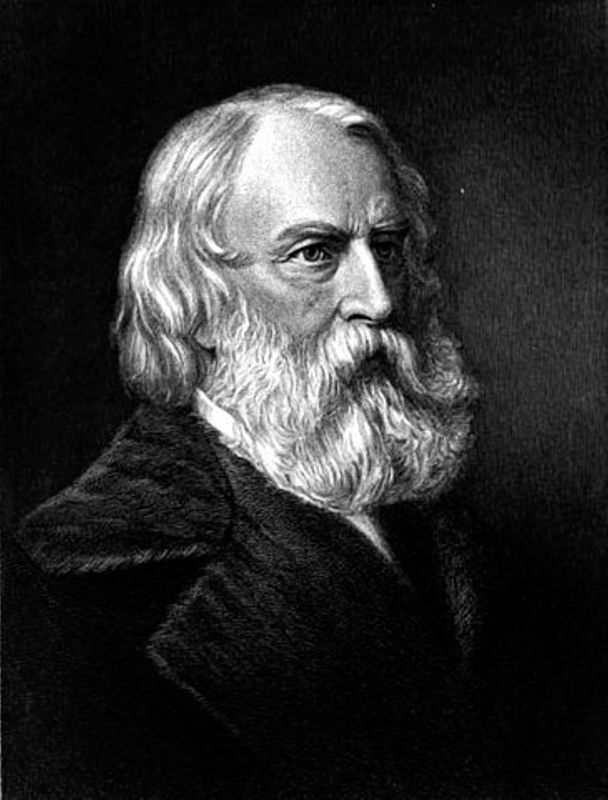 Longfellow is regarded by many as the most popular American poet of the nineteenth century and is credited with bringing European cultural traditions to an American audience. While Longfellow is best known as a poet, he also worked as a translator and as a professor of modern languages at both Bowdoin College (his alma mater) and Harvard. His most well known poems include: The Song of Hiawatha, Evangeline, and Paul Revere’s Ride. After his death he became the first American honored in the Poet’s Corner of Westminster Abbey. Longfellow maintained a long friendship with his publisher, James T. Fields, and Fields’ wife Annie Adams Fields, who became Cather’s friend. In “148 Charles Street” (1936), Cather recalled that in her “father’s bookcase” during her childhood “there were little volumes of Longfellow” published by Ticknor and Fields, and quotations from Longfellow’s poetry appear in several of her novels. Hawthorne, Nathaniel (1840-1864). American novelist and short-story writer. 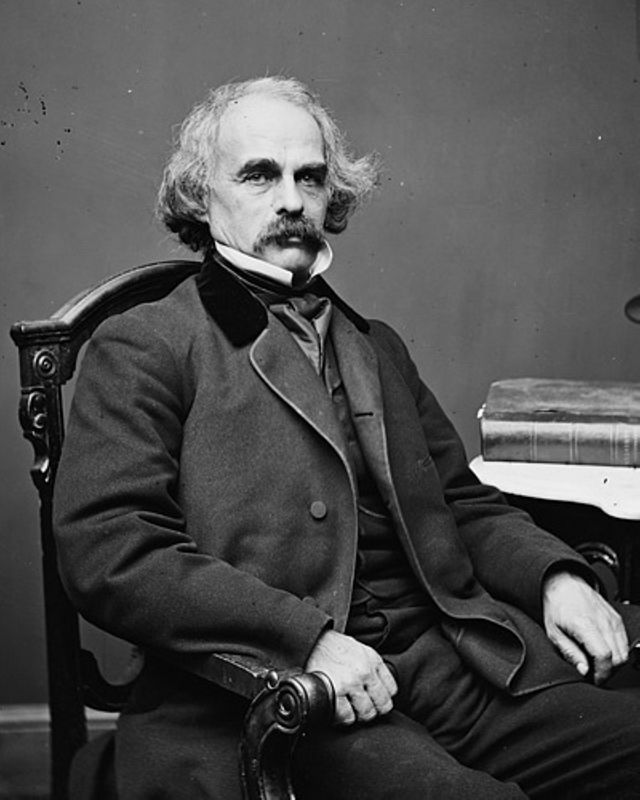 Born in Salem, MA, Nathaniel Hawthorne graduated from Bowdoin College in Brunswick, ME, in 1825, and returned home to Salem to devote himself to writing. Several times during his career Hawthorne accepted government jobs to supplement his meager income from writing. His appointment at the Boston Custom House in 1839 features in his novel The Scarlet Letter (1851). In 1842, he married Sophia Peabody, and for three years they lived in Concord, MA, where Hawthorne was exposed to figures in the Transcendental movement. James T. Fields of Ticknor & Fields helped Hawthorne to gain critical recognition and to achieve a modest commercial success from his novels and short story collections in the 1850s. Hawthorne died in Plymouth, NH, while traveling with Franklin Pierce, his friend and former United States president. During Cather’s childhood her family owned volumes of Hawthorne’s fiction published by Ticknor & Fields, and she referred to him frequently in her newspaper criticism of the 1890s. 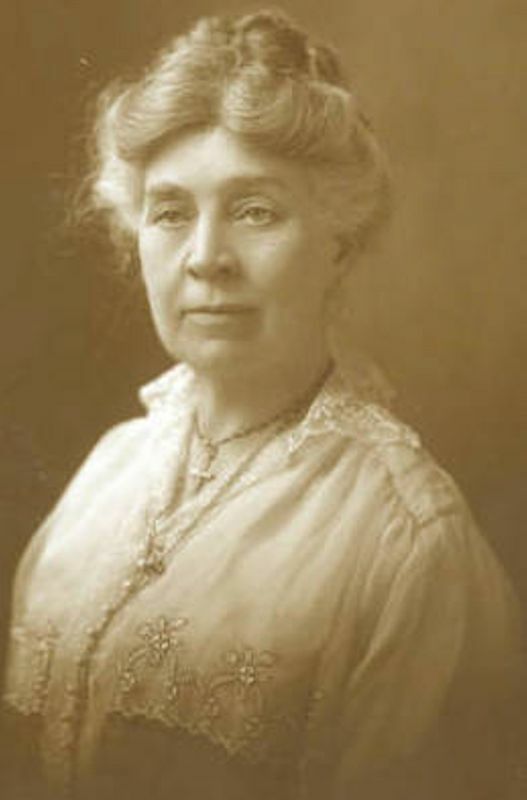 In “The Novel Démeublé” (1922) she praised his technique in The Scarlet Letter, and in her preface to The Best Stories of Sarah Orne Jewett (1925), she classed the novel with Mark Twain’s Huckleberry Finn and Jewett’s Country of the Pointed Firs as one of “three American books which have the possibility of a long, long life.” However, she classed his House of the Seven Gables (1851) with “stuffy or dull” required reading in high schools (#1649). In 1925 she also spoke at a symposium at Bowdoin commemorating the centennial of the graduation of Hawthorne and his classmate Henry Wadsorth Longfellow.